I got some veal chops cheaply in Waitrose and then this recipe popped up in my Mum's copy of the Telegraph magazine. It was lovely and tasty, I love the combination of the veal and mushrooms. Rub the chops with the oil and season. Set aside. Preheat the oven to 190C. Meanwhile, cook the potatoes until tender. Heat a frying pan over a medium high heat and add a splash of oil. Add the chops and cook until golden brown on one side, about 5 mins, then turn and cook for another 5 mins. Remove the chops to a roasting dish and roast for 15 mins. Leave to rest for 10 mins. Meanwhile, drain the potatoes, return to the pan and mash with the butter and milk. Season. Heat a large frying pan over a high heat and add the oil and butter. Add the garlic and mushrooms and cook until the mushrooms are golden brown. Then add the wine and reduce until the liquid disappears. Remove from the heat, season and toss in the parsley. Divide the mash between 4 plates, top with the veal and the mushrooms. 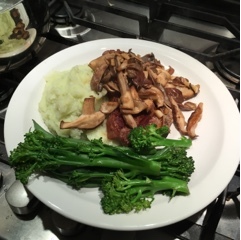 Drizzle any mushroom juices round the plates.